The Cinque Terre are five towns which sit on the Ligurian Coast. Originally they were accessible by boat but with tracks between each town. The people existed mainly by farming olives and grapes on the steep hills which surround the towns. The hills were extensively terraced to provide usable land. 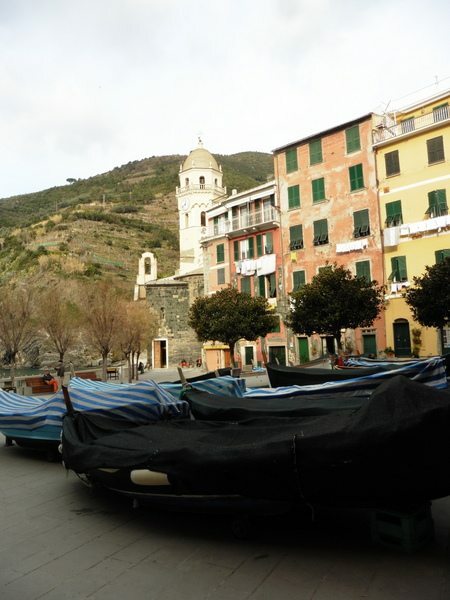 The town of Monterosso also had a small fishing fleet. In the 15th century the Cinque Terre came under increasing pirate raids and as such the villages installed fortifications. Many of them are still visible. 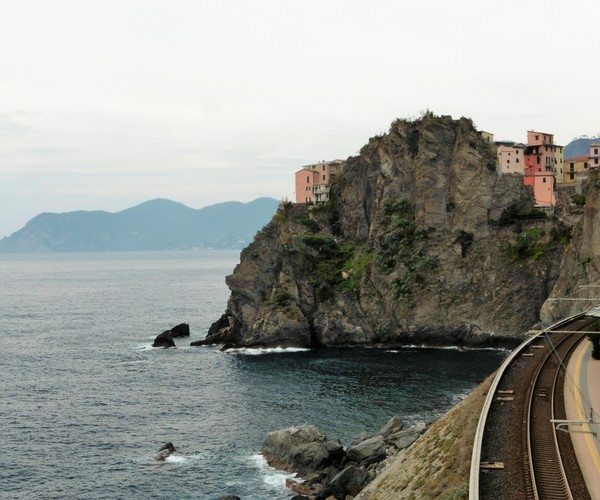 We spent two days exploring the Cinque Terre, firstly by train and then by bike. Michele had been advised by the receptionist at the hotel that the best way to see the villages along the Cinque Terre was by train. Our vision as we set off was a train winding along the coast with views over the sea, turned into a reality of tunnels and glimpses of the ocean. After a day of waiting for trains, being stuck on a train where the doors did not open and having to wait an hour for the next one…. we thought it was the pits. In the end we agreed that exploring by bike is the much better option. While we were waiting we met a lovely young couple from Wisconsin on their honeymoon. They had spent a fortnight travelling around Italy and were planning to hike around the Cinque Terre. The Cinque Terre National Park is quite famous for its hiking trails. Many people stay at one of the little towns and explore the National Park. Some make use of one of the luggage transfer services and walk the length of the Cinque Terre. It also had us wondering whether we had expected too much after spending so much time exploring Croatia’s beautiful coastline. 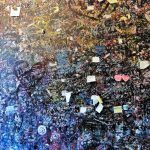 We thought maybe we were becoming like many travellers who compare everything to “back home.” However, there’s no other way of saying it but our first experience of the Cinque Terre was underwhelming. Our first stop was Monterosso al Mare from where we planned to start our visit before working our way backwards along the train line. 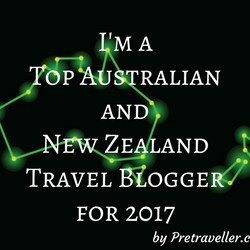 Michele had read a blog which went on and on about Monterosso so we were expecting it to be awesome. Well don’t believe everything you read and I suggest don’t go on what we say either. Like every thing in life, find out for yourself. 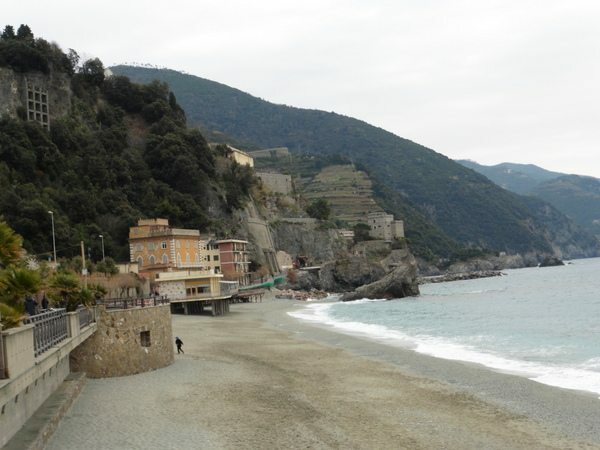 Monterosso fronts a beach with the train station on the edge of town. 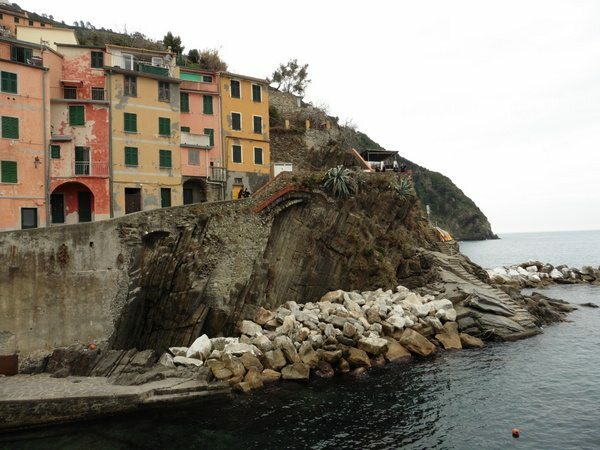 It’s the largest of the towns along Cinque Terre and has some nice views. The sound of jackhammers greeted us as we walked along the walkway towards the centre of town. Apart from the garbage truck it was the only sign of life in the town. Along the beautiful beach front everything was closed for the winter. Wandering along the beach we soon discovered Il Gigante. The 14metre high sculpture of Neptune armed with a trident and holding a shell shield aloft was built from concrete in 1910. Allied bombing during WWII damaged the sculpture, destroying the arms, shield and trident. These days it looks like an ancient monument holding up the attached building. 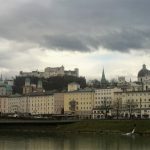 We walked up through the steep streets towards the old tower in an attempt to discover the places which the blog writer was talking about. Well the writer must’ve been an old sailor because it seemed like they followed the old naval tradition of “never let the truth get in the way of a good story.” We could not find any way or signs for the old town so gave up. 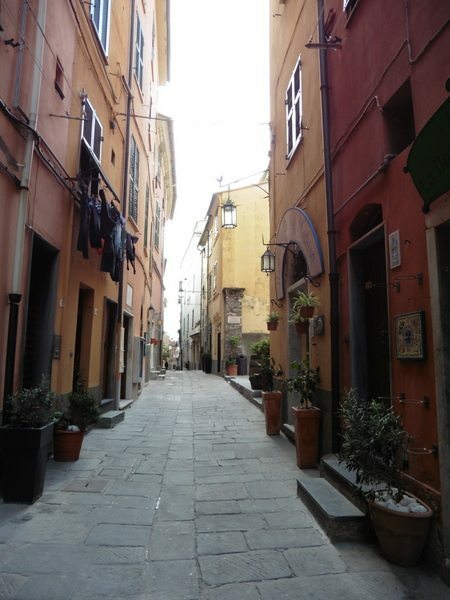 Walking through Monterosso we found that there were a few old building but most of the buildings were actually holiday apartments. 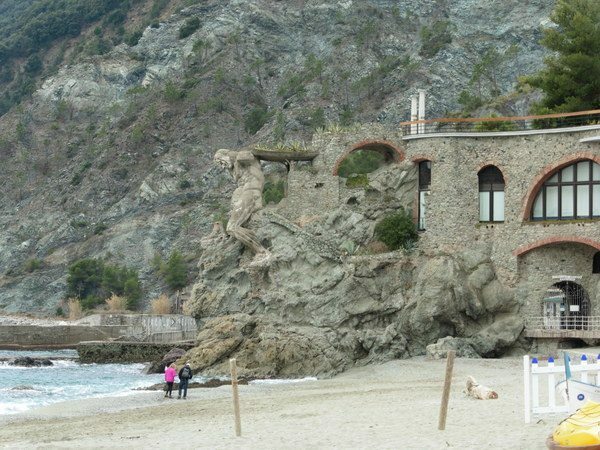 Now you probably think that we bagged Monterosso a little harshly but personally we think that the place would be awesome in the warmer months with all the restaurants open, water sports, beaches and hiking. The place would be absolutely buzzing. However, in winter it’s D E A D. Apart from the sound of jackhammers, and the odd tradesmen there was nothing happening in Monterosso. 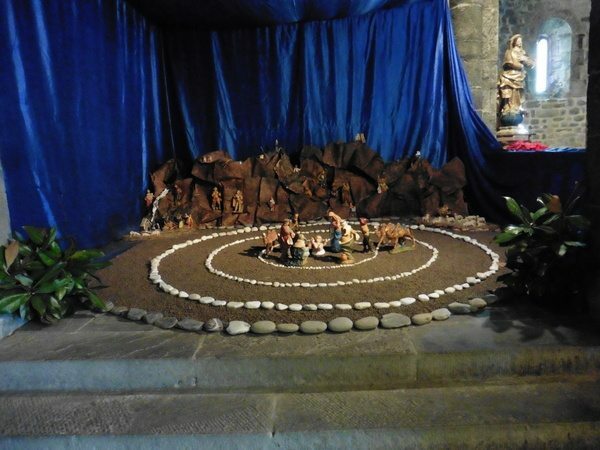 A highlight was the Chiesina Di Santa Maria Nascente and it’s unusual Nativity. The family chapel was built in the 18th century attached to the Villa Saporti. By the 1950’s it was unused and almost a ruin. 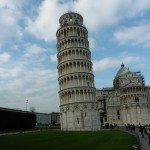 It was bought by a family from La Spezia with the view to convert it to a small villa but they sold it in 1961 to locals. There was enough interest in the town at that stage for the chapel to be reconsecrated for worship. 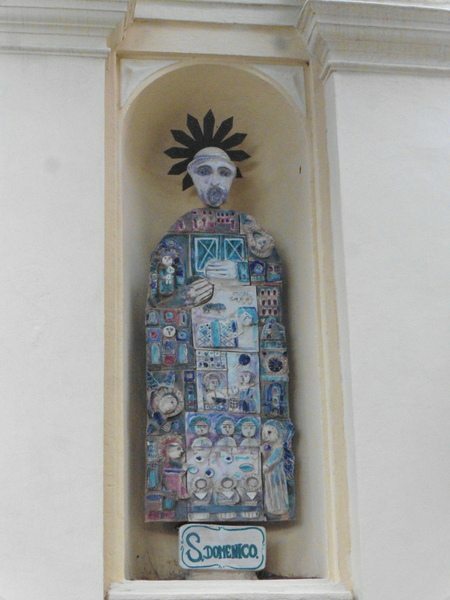 The buyers enlisted artist Emanuele Luzzati to sculpt two statues for the niches in the front of the chapel. The statues were of course St Andrew and San Domenico, both of whom were connected with their families. Unlike the standard sculptures that adorn the front of churches the two statues are awesome. They look like a pair of doors with heads on top. Their flat bodies feature the various deeds associated with the saints in a cool rock and roll sort of way. 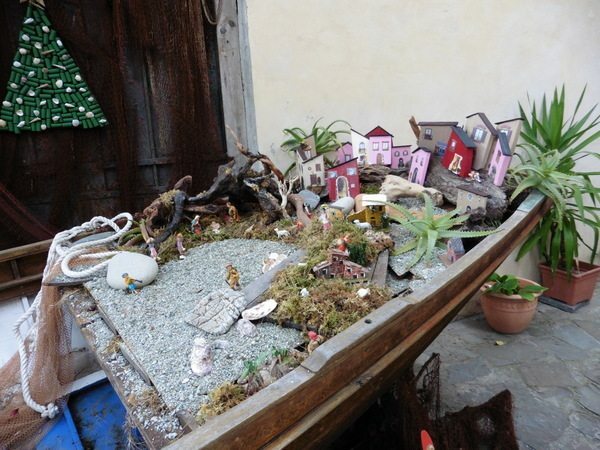 In the front courtyard a small wooden dinghy housed a cute nativity scene. The chapel was a surprising find in the sleepy town it showed that despite the place being closed for winter, life still existed in the town. As there was nothing else happening in the little town we headed back to the train station. After a short wait we headed towards Vernazza. When the train arrived in Vernazza the carriage doors wouldn’t open. We rushed from carriage to carriage trying to open the doors but to no avail. Other passengers said that it was because our part of the train was in the tunnel. What a load of tosh. The platform extended into the tunnel. Well whether we liked it or not we headed on to Corniglia. This time we were able to get off the train. Well as we walked up the hill we stepped around a vacant bus which we later learnt could’ve taken us to the town perched high above the train station. Unfortunately we followed the crowd along the walkway above the train line only to discover that we were at the bottom of the hill and there were about 400 steps up the steep hill to the town. Well that wasn’t going to happen so we retraced our steps to the station. On the way back towards the bus we noticed it disappearing over the hill. Oops….. Can this day get any worse….. The mood was pretty dark by the time we arrived back at the station and it didn’t get any better during the forty minutes waiting for the next train. 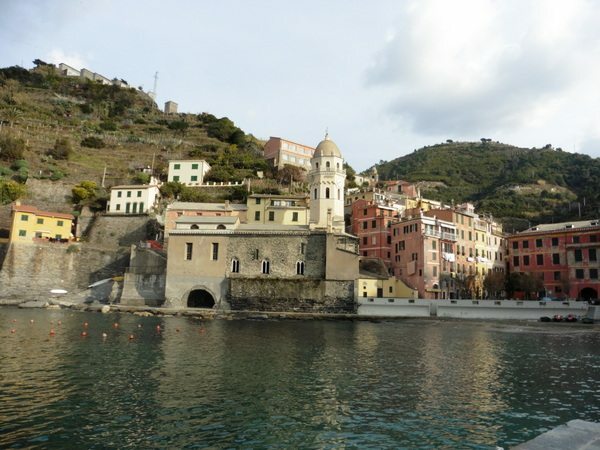 However, our mood lifted by the time we reached Vernazza. The hills surrounding Vernazza are terraced with grapes and olives which are a real feature of the Cinque Terre. The walk down from the station was lovely. Vernazza features old buildings built almost on top of each other. The buildings are connected by little alleyways which sometimes are through archways beneath other buildings. The stone buildings are all plastered and painted in vibrant colours. About half way down the main street was the small stone chapel of Santa Marta. It was a simple chapel with quite a large plastered front. At the bottom of the street houses line the cliffs and a small breakwater protects the boat harbour from the sea. 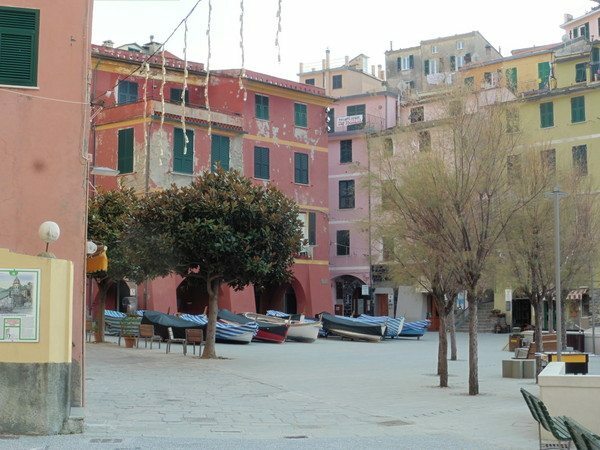 Overlooking the boat harbour is the market square which surrounded by the old town hall, restaurants and the Church of Santa Margherita d’Antiochia. The church dates from the 13th century with later renovations in the 16th, 17th centuries which included the addition of the octagonal bell tower. On the outside the church is plastered and painted however on the inside it’s simple stone brick. The central nave is lined with round stone columns of white and black granite. They’re striped however there’s no uniform pattern between columns. Probably when it was originally built everything was plastered over and painted. One adaptation which was quite funny was the line of outdoor gas heaters in the central aisle. The church must be cold and drafty in winter. It also had a beautifully simple nativity inside it. Outside the church in the piazza a numbers of small fishing boats were pulled up for the winter and many others lined the sides of the Main Street which led brought the town. It was really lovely wandering through Vernazza looking at the beautiful brightly painted old buildings and it did brighten our day after the rocky start. Unfortunately there were only a few restaurants open in town and we headed for the most local looking one. Michele was busting to go to the toilet so we quickly found a table to dump our coats. As luck would have it she was too slow and a local man beat her to the toilet. That’s when the fun began. As she sat back down (at the tabe)a little bald head emerged around the toilet door. Minds out of the gutter please. He looked around for a few moments before disappearing back inside. We looked at each other and said “the lock on the toilet door must be broken”. A few moments later he reappeared briefly before disappearing. He reappeared a third time by which time we were thinking “what the …..?” This went on for nearly ten minutes…. When the waiter arrived we asked him about the strange behaviour of the toilets occupant and he quickly shooed him out of the bar. There was nothing sinister about the incident, he was just a local who plays hide and seek with the patrons. He reappeared later whilst we were eating lunch but the waiter stopped him before he got too far. It was just funny laughing about it later but at the time we had no idea what was going on. After lunch we caught the train to Manarola. The train station at Manarola is on the far side of the mountain to the south of the town. The town is accessed by a long tunnel from the station. A raised piazza overlooks and separates the lower part of the town from the upper part. 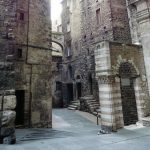 The main street winds around the piazza and down a steep ramp into the lower town. Either side of the street are lined with boats pulled up for the winter. The brightly coloured boats line the way down to the cliffs above the sea. Manarola sits above the sea and a natural boat harbour is formed between the rocks. During the winter months the boats are hoisted from the water using a dockside crane. As Manarola is limited in space the boats are squeezed in everywhere. Like nearby Vernazza, the town of Manarola has lots of lovely plaster covered stone buildings painted in bright colours. There were lots of restaurants however most were closed. At the bottom of the town a walkway extends up to an old fort on one cliff and around the cliff in the other direction. From the cliffs there’s some great views along the Cinque Terre coast on a clear day you can see a few of the towns but not to be for us. As we headed back towards the train we saw the sign pointing to the “lovers walk” a cliff top walk which joins Manarola and Riomaggiore. There was also a sign pointing to a cafe which we thought would be a perfect spot for a coffee. It was not to be the cafe was closed as was Lovers Walk right next to the cafe. To add insult to injury the cafe was closed until March. It really made our blood boil that the cafe owners didn’t bother to post a notice to tell everyone that the cafe was closed. Of course our detour to the cafe made us miss the train and of course we then had to wait nearly two hours for the next train. It sort of summed up our day on the Cinque Terre. On the train back to La Spezia we discussed how our expectations outweighed the reality. Should we be like the groups of Japanese and Chinese who file off the train snap a heap of photos before filing back onto the train for the next stop? I think we were just trying to do too much. It’s much better just to do it our own way by just meandering but taking the train really did not allow that to happen. We realise during the summer there are more trains but there are also many more people so you need to weigh it up. After arriving back in La Spezia and freshening up it was time to head to a bar for dinner. 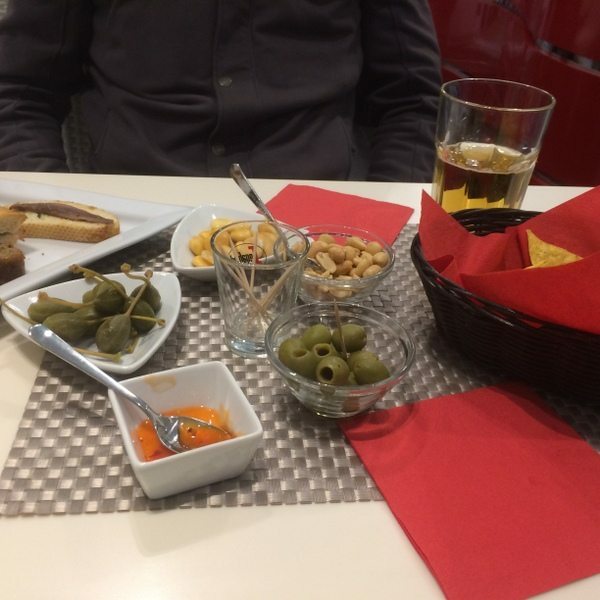 One of the traditions in Italian bars is to serve hors dovres with drinks. It’s a bit like the Spanish with their tapas. Well we found a place where they put on a real nice spread with a drink. After we ordered drinks the waiter arrived with all different plates of finger food and bowls of nibblies. It was a great way to unwind after a stressful day. 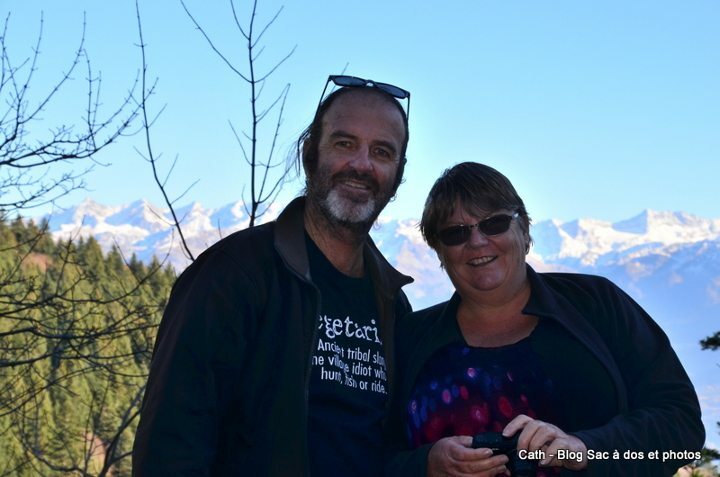 It also gave us time to thrash out what we wanted to do in Cinque Terre on the second day. Our second day on the Cinque Terre started much better. The first stop was Porto Venere, which technically isn’t part of the Cinque Terre but is on the same coast. 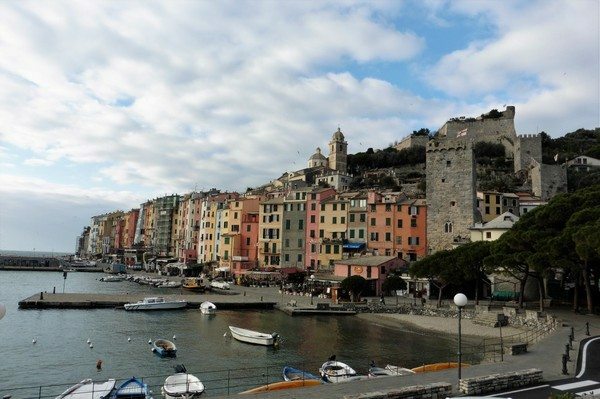 Porto Venere is only 16 km’s from La Spezia and it’s a lovely drive which takes in great views across the harbour, offshore islands, and distant snow covered hills. 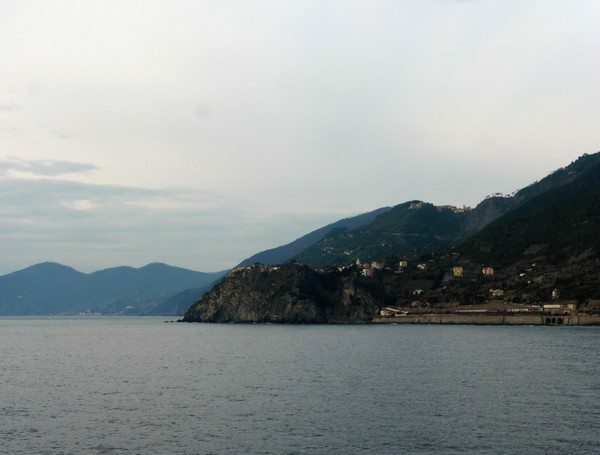 The road winds along the coast, in and out of bays, through olive covered hills on its way to Porto Venere. Along the way it passes through the town of La Grazie where there’s lovely glimpses of small bays. At the top of the hill above Porto Venere there’s magnificent views across the harbour to the nearby island of Palmaria and Torre Scuola. It was a lovely scene. A cold and frosty morning with a little fog hanging over the water. Small fishing boats slowly heading towards Porto Venere. A one way road system leads down into the town where at the bottom of the hill a boat harbour and a lovely restaurant area stretches out along the shoreline. We parked up amongst the locals motorcycles and took a walk. 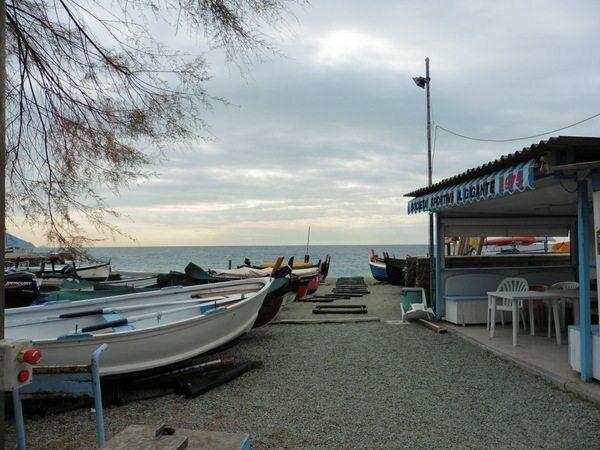 All the seafood restaurants along the port were closed and for a moment we thought we’d arrived at another town closed for the season like the ones along the Cinque Terre. However, as we headed inside the old walls of the fortified town we soon discovered that there was heaps of life in Porto Venere. Like the towns we visited yesterday the sounds of jackhammers and hammer drills echoed around the old buildings. Luckily like tradesmen all over the world they needed a smoko break and the local cafe’s were all chockas with tradies. We found a nice looking cafe decorated with anchors and maritime objects. It was pretty cool. They also served great coffee and chocolate croissants. The town of Porto Venere has been fortified since at least the 12th century and it’s lovely wandering up through its cobbled streets. 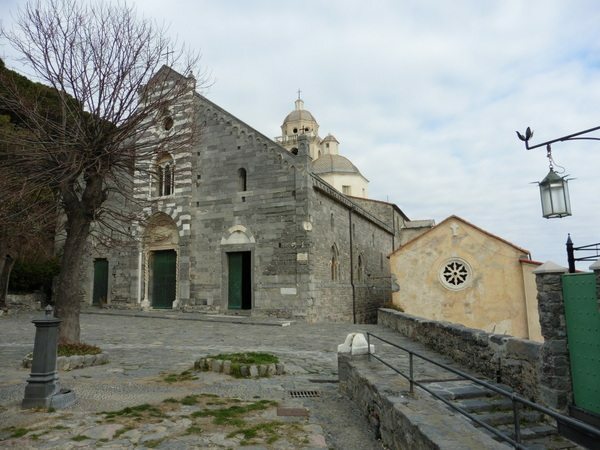 On the rocky point in front of Porto Venere sits Chiesa San Paulo. It’s actually two structures consisting of an old 5th century chapel and a late 12th century gothic church. The gothic church was built from black and white stone bricks which gives it a striped appearance. Inside there’s evidence of the older church which the gothic church was built over. It’s quite a simple structure overlooking the coast and the sea. From the church there’s great views along the rugged coastline and it was along here that Lord Byron would supposedly sit and meditate. 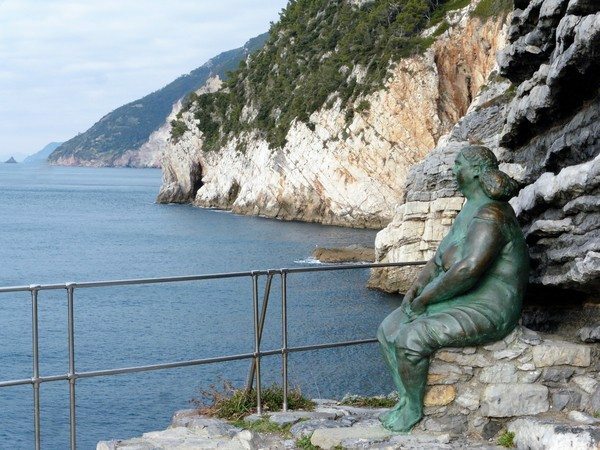 Overlooking the sea is a lovely bronze statue entitled “Mother Nature”. The middle aged motherly figure sits looking out to sea and really captures what Mother Nature would look like if she was human. 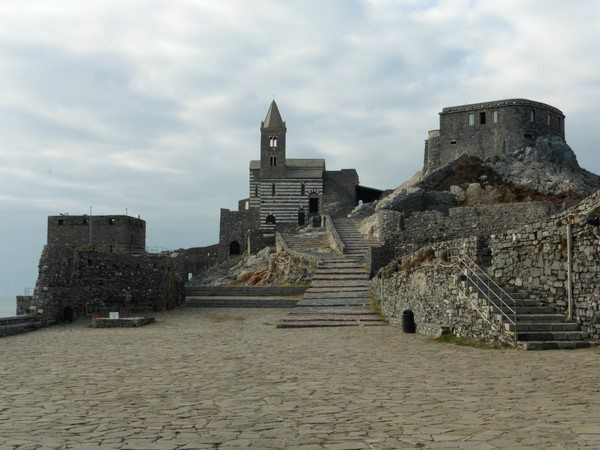 High above the town is Doria Castle, built by the rich Genoese Doria family to protect their asset of Porto Venere. As the old town is built around the steep hill the streets are pretty narrow and steep in places. We made our way up hill to Chiesa San Lorenzo, a Romanesque church dating from 1098. It was built by the Genoese and still bears the mark of the winged lion on the front. Unfortunately Porto Venere is at the end of the road and there are no connecting roads to the other towns along the coast. We retraced our route past La Grazie where we headed up over the mountain towards Riomaggiore. It was great riding up through forests of National Park and patches of olive groves. As we reached the coast we got a birdseye view of the Cinque Terre. The local farmers grow their grapes and olives on terraced hills that are so steep that they use a monorail system. A little mower motor drives a pinion along a rack system underneath the rail dragging the small carriages up and down through the orchards. Along the sides of the road the monorails disappear over the edge or up through the vines and olives. The road wound along the coast around gullies and up steep hills. There were many times when I could feel Michele’s legs squeezing the bike a little harder as I came into a corner. 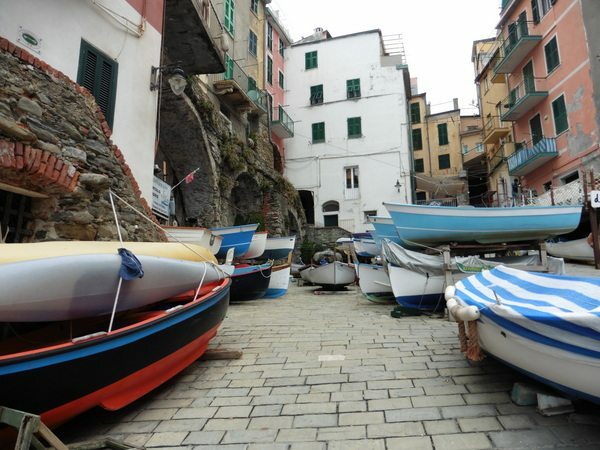 Our first stop was Riomaggiore, a tiny town which lies at the bottom of a steep gully. The road winds down a steep grade as it makes its way towards Riomaggiore. It’s not a suggested drive for those of faint heart. One slip and you’re off the cliff and on your way to Africa. Land in Riomaggiore is such a scarce commodity that the cemetery is high above the town. 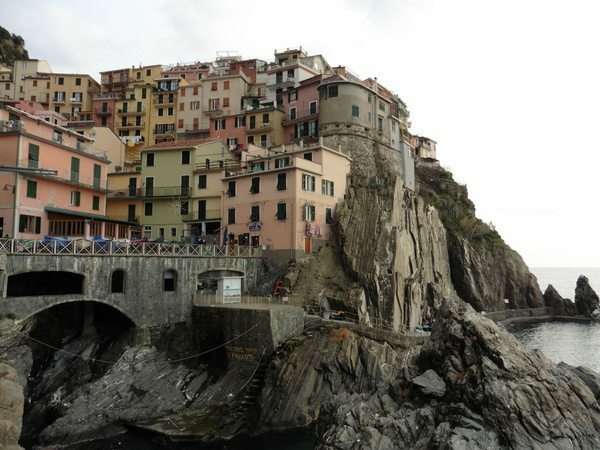 At Riomaggiore we parked in the motorcycle parking above the town and walked down the steep grade into town. Parking in Riomaggiore is off limits to non residential parking and boom gates control access to the town. Above the town is parking for cars with shuttle buses however in winter I think the wait could be a little long. Walk down through town it’s similar to the other Cinque Terre towns with brightly coloured plastered buildings on either side of the street built up into the surrounding hills. Tiny alleys link the buildings to the main street. The hills above the town are heavily terraced with olives and grapes growing in every available space. It was a nice little town much like the other ones we’ve visited with the standard stone buildings covered in plaster and painted bright colours. Once again there were only a few places open and we stopped off for a drink at a Birrateria which had no food. Later we found a pizza shop where we stopped for lunch. Judging by the people we met and talked to the place would really kick off in summer with the massive influx of tourists. It must be strange however to be a local. Day after day seeing people getting off the train, walking through town snapping a thousand photos before getting back on the train without stopping for a drink or a chat. It’d be like living in a fish tank. Heading out of Riomaggiore the views along the coast were great but every time we’d find a spot to take a photo there’d be a tree blocking the view. The road along the coast wound around the hills and up though some steep countryside. 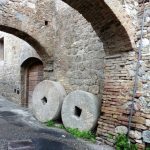 As we passed through the village of Groppo, Michele leaned forward and asked “you are not going up there are you?” as she indicated towards a steep section of road winding around the coastal mountain. “Of course” was my answer as I dropped it back a gear and powered out of the corner. 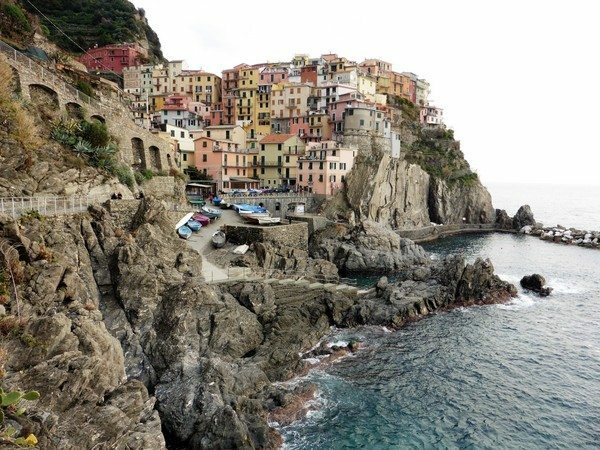 The little villages which lie at the rear of the Cinque Terre don’t have the tourist numbers of the popular spots but they look like the places which would be worth visiting to get a real local experience. Our next stop was the town of Corniglia, which sits atop a mountain spur overlooking the coast. The road winding down to it was fairly steep and wound around the mountains as it slowly descended towards the town. When we arrived in town we found the locals parking and parked up. 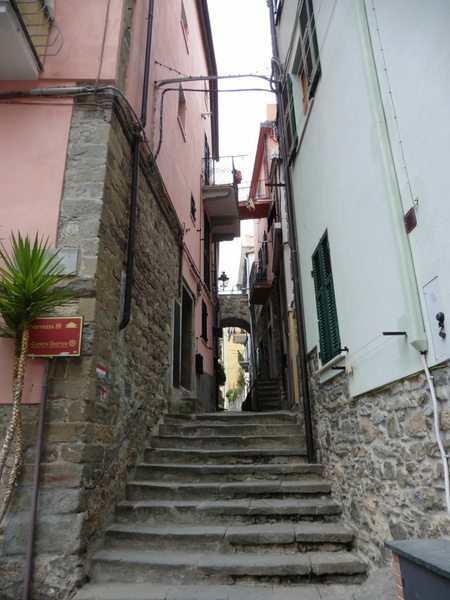 Corniglia is probably the most authentic of the villages of the Cinque Terre and has a population of about 150 people. Most of the older buildings are built of stone and are lower set than many of the newer buildings along the coast. 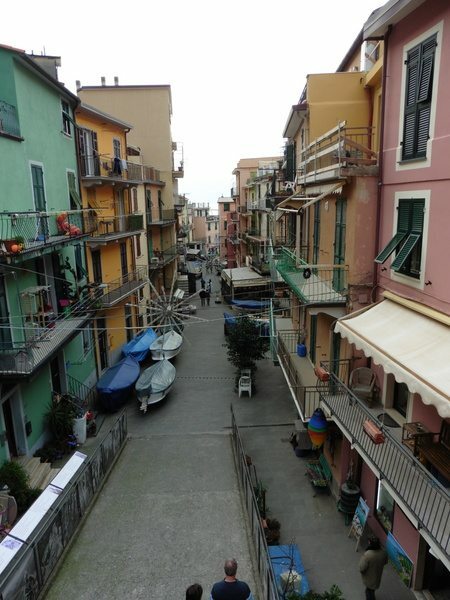 Corniglia features narrow lanes and quirky shops which makes it a really quaint little village to visit. Wandering around the village we were quite taken back by its charm. 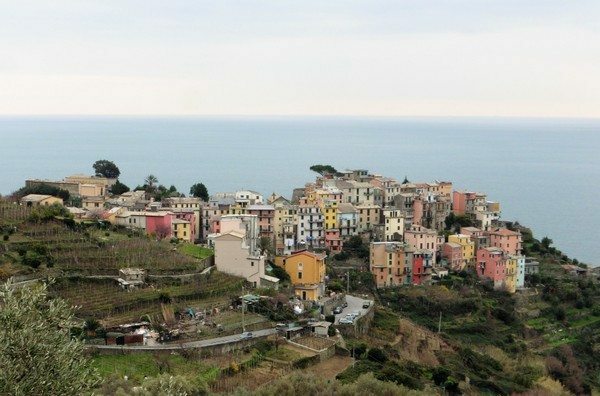 It has wonderful views and from Corniglia there are views along the coast to Manarola and Riomaggiore to the south also Monterosso and Vernazza to the north. By the time we finished exploring the town and Chiesa San Pietro, the sun was rapidly descending towards the Mediterranean Sea. That was our signal to head back to La Spezia. The road back to La Spezia was just as much fun as the trip out and we were really glad we took the bike out. It was a much better way to explore the area. Arriving back in La Spezia once again we headed to the bar we found last night. They had a great atmosphere and after a late lunch in Riomaggiore we didn’t feel like anything too heavy. So a drink and finger food was perfect. It was a great way to end a lovely day visiting the Cinque Terre. 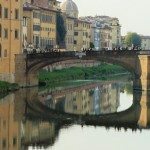 Tomorrow we are heading to Tuscany, but watching all the snow being forecasted we are crossing our fingers we don’t get any along the way.